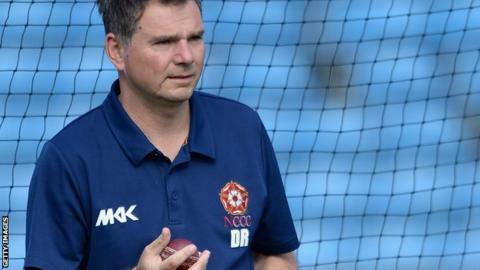 Northants head coach David Ripley has hit out at their lack of fight after they crashed to an innings defeat inside three days against Durham. The visitors were bowled out twice in the space of three-and-a-half hours as Durham seam bowler Chris Rushworth incredibly took 15 wickets in a day. "To fold so meekly in such a short space of time is very disappointing. "The level of defeat is embarrassing. We're a better side than that," Ripley told BBC Radio Northampton. "We were also very poor with the ball, it was never a 390-surface. It is not just about poor batting, we didn't bowl well, we dropped some catches." Rushworth finished with figures of 15-95 to break Durham's 19-year-old record for the best match figures. "We didn't cope at all, he looked like he was going to get a wicket every over. And he did, more or less," said Ripley. Northants trailed by 309 on first innings after being bowled out for 83 but, after home skipper Paul Collingwood asked them to bat again, they reached 33 without loss before their decline began again. Relegated Northants were eventually skittled for 90 and consigned to the heaviest of their 12 defeats in 15 matches so far this season, losing by an innings and 219 runs. "That is not the first time this year that we have been very very well beaten," said Ripley. "We are not doing ourselves justice. "At the end of the game there was honesty from the players, they are not hiding away."